BAT-MAN: The Rising Sun Tavern, where a publican fought off a bat-wielding attacker. A Nelson publican is being hailed a hero after taking on a bat-wielding assailant who had allegedly beaten a middle-aged patron unconscious outside his pub in the early hours of yesterday. Martin Coram, publican at the Rising Sun Tavern, was struck in the face with a cricket bat when he stepped in to save the 56-year-old patron, being hit with the bat as he lay senseless on the ground. But the plucky publican refused to back down, exchanging blows with and wrestling the bat off the attacker, who then fled. An ambulance rushed the patron to Nelson Hospital, where he was treated for head injuries and a possible broken arm. 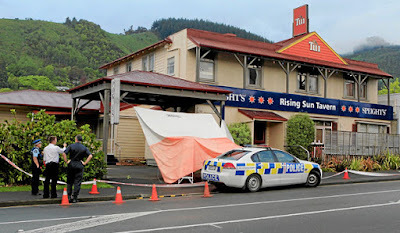 Nelson CIB Detective Sergeant Mark Kaveney said the patron was attacked as he left the Waimea Rd tavern at 1.25am to get a taxi home. The man was hit in the head with a cricket bat and knocked unconscious, Kaveney said. The attack continued as he lay on the ground, he said. Coram, hearing noises, looked out the door and saw the patron lying on the ground and raced to protect him. "The attacker swung around and smashed (Coram) with the bat," Kaveney said. "He has then tackled the attacker. There was a stoush and they traded blows. He managed to wrestle the bat from him and the attacker has then run off." Coram's actions were "extremely brave". "Anyone who gets blows to the head – and this guy [the patron] had a large laceration – there is potential for death, and that's what was happening. It had the potential to be absolutely catastrophic. "I think it was very brave of the person concerned [Coram] to risk their life to save another person like that. This person wasn't known to him, and just the fact it was dark, raining, he [the attacker] had a weapon and [Coram] didn't know what that weapon was... he can seriously pat himself on the back. He just challenged him and dived out there." The attack was unprovoked, and "very disturbing", Kaveney said. The 56-year-old patron had "had words" with a man inside the tavern earlier in the evening, Kaveney said. The victim had been "advising" the other man about his behaviour, he said. "There had been a bit of to-ing and fro-ing but nothing major," Kaveney said. Nelson Mayor Aldo Miccio said Coram was a "hero". "It's fantastic he had the courage to come to the aid of the victim. If he wasn't there it could have turned out a lot worse. There is no doubt he is a hero. He did something courageous and selfless." Coram was unable to talk to Sunday News yesterday. His family said he was recovering from the incident. The publican and the 56-year-old patron were treated at Nelson Hospital and both had since been discharged. A 34-year-old man will appear at Nelson District Court tomorrow facing charges of serious assault. 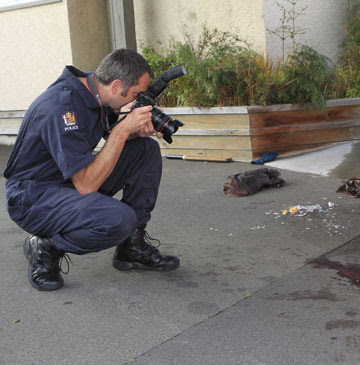 CORDON: Officer Marty Bagnall collects evidence at the scene of the incident.